This was down around half a penny from a week earlier, when the price stood at 140.60p/kg following a sharp fall of over a penny in the Christmas week. A slowdown in the pig market is typical in the post-Christmas period. The estimated weekly throughput totalled 137,800, virtually on par with the same week a year ago. Slaughterings during the Christmas week are estimated as slightly higher than 2017 levels, at 104,900 head (+1 percent). During the past two weeks SPP carcase weights have also picked up, averaging 85.65kg in the Christmas week (the highest weight on record) and falling back just 100g in the latest week. In addition, probe measurements have also increased and averaged 11.4mm then 11.3mm in the latest two weeks. Fatter, heavier pigs are the result of delayed slaughterings due to the Christmas holidays. 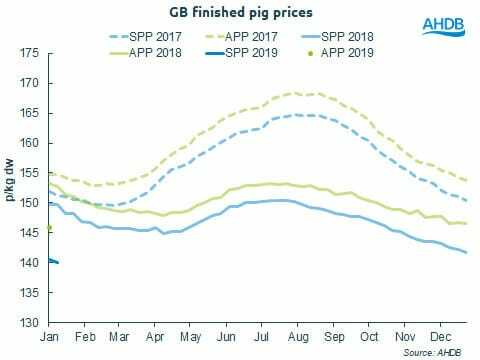 A higher number of pigs outside of normal contract specification will have also contributed to the drop in the average price. For week ended 29 December, the EU-spec APP stood at 145.98p/kg, also around half a penny lower than the previous week. For week ended 22 December, the price had averaged 146.56p/kg, recording only a 0.11p weekly decline. As the SPP has been falling more sharply over the Christmas period, the gap between the SPP and APP has widened, reaching 5.38p in the latest week. This is the largest difference since the series began in April 2014. The 30kg weaner price has been fairly volatile in the past few weeks, standing at £47.37/head for the week ended 5 January. This was almost £3/head higher than the week before, though prices had dropped by over £3/head in that week. Fluctuations in the 30kg weaner price probably reflect low volumes traded over the past couple of weeks rather than any significant change in the market. The price of a 7kg weaner edged up this week (+45p), though again this follows a week of decline (-82p), to stand at £36.07/head.